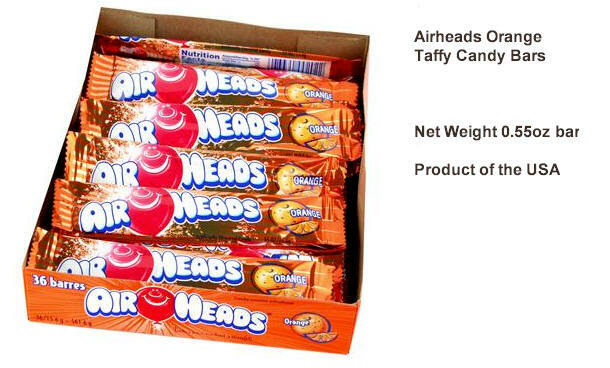 Airheads Orange Candy Taffy 36ct box - For kids & grown-ups ages 6 to 96, Airheads is the candy to be seen with since 1986. Adults still love and enjoy airheads the same way they did growing up. With a variety of mouth-blasting fruity flavors and the built-in play value of a soft, twisty, stretchy, consistency, Airheads lets kids feel "out of control." Airheads is delicious fun ! Airheads Orange are a tangy taffy chewy candy that come in individually wrapped strips, 36 bars in each box. For kids & grown-ups ages 6-96, Airheads is the candy to be seen with since 1986. Adults still love and enjoy airheads the same way they did growing up. With a variety of mouth-blasting fruity flavors and the built-in play value of a soft, twisty, stretchy, consistency, Airheads lets kids feel "out of control." Airheads is delicious fun !